Σίσυφος, or Sisyphus, was a character of ancient Greek mythology. He was a king of old and a tricky, scheming, knavish one at that. He was so good at fooling the gods, he even cheated them out of death. Finally, Zeus and the other Greek gods had enough and condemned him. 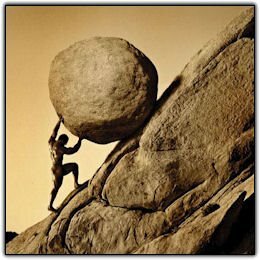 For all eternity Sisyphus was cursed, forced to push an immense boulder up a hill. This may not seem to be that bad, however the gods added their own Sisyphusian twist. Just before he reached the top of the hill, before he was able to rest and be at ease, the boulder would wobble and fight against him, until it was happily rolling back to level ground. Then, he’d climb down after it and begin the process all over again. Writing can be like this. We struggle and toil at our own little schemes we have created. At times we have progressed and have momentum and may very well reach our goal. There are those other times, however, when we see our novel, poem, or novelette, back down at the bottom of our artistic hill. Is it worth it? Yes! But also, no. Sometimes it is a long period of writing and deleting, rewriting and writing again. We may be fooling ourselves that we will ever reach the top. Lately, I have been focusing my efforts into my own final push. I know that as I race to finish this present draft before the end of the year, that, as the calendar turns its page, I will once again be at the bottom of the hill looking upwards at yet another draft. You may think that, like Sisyphus, another trip to the top may not be worth it. As a writer writing about the writing life, I submit that is all we can do. And, though we have yet to reach the top, we know we are closer to our goal having finished a draft, than if we had never started in the first place. This month is National Novel Writing Month or NANOWRIMO. I am not working on a new novel but trying to finish an old one and it is proving to be more difficult than I imagined. As I get toward the finish line I feel more and more tired. I also have bouts of avoiding opening the document containing my latest chapter, sort of like a kid who is forced to eat something he doesn’t like and does everything they can to get out of it. Blogging is an outlet of writing so I can feel accomplished. I can feel like I have written something, and takes care of the “itch” as C.S. Lewis would say. But, that’s not my goal. Blogging is nice, but the book is my mission. I have planned many times to lay down words, but when the time comes I write a paragraph then delete it. I write another and delete it. The inner critic gets the best of me. I have had a plan to write on my novel many times. I have even felt inspired and wrote a quick 500 words. However, I know they are poor attempts of regurgitating the golden ideas as perceived by my mind. I thought for a while of why the sudden rush of avoidance? Why the shouting of the critic of my mind – when I thought I had put him to bed? I now know why. I had some friends come visit who I see about once a year. It was a pleasure seeing them, but at the end of out time together we spent the last spare minutes either telling a quick joke or sharing a brief story, doing anything to extend the time and to not bring up the fact that our time together is now at its end. This is the reason I am not rushing to finish. No one likes to say goodbye. No one likes to end a good time, and not just a fun time, but something so satisfying it is a glimpse of life or the world as it should be. Thus, I confess today that I don’t want to say goodbye to my friends. I don’t want to have invented them only to dismiss them. I have more novels planned with some of them, but others are gone dismissed into the “shadowy world of my mind”. Here is Charles Dickens putting my thoughts into better words. This is a snippet of the preface of David Copperfield (Penguin). I think I now know what he was talking about. It will be grand to finish, but I will miss the people in my book, once their/our adventure is over. I do not find it easy to get sufficiently far away from this Book, in the first sensations of having finished it, to refer to it with the composure which this formal heading would seem to require. My interest in it, is so recent and strong; and my mind is so divided between pleasure and regret – pleasure in the achievement of a long design, regret in the separation from my many companions…It would concern the reader little, perhaps, to know, how sorrowfully the pen is laid down at the close of two-years’ imaginative task; or how an Author feels as if he were dismissing some portion of himself into the shadowy world, when a crowd of creatures of his brain are going from him for ever. Have you ever been too inspired to sleep? I have, and did feel that way yesterday at midnight. It’s like your mind is humming like a finely tuned engine with such momentum that something must be done. An outlet better present itself or you might explode. I once explained it to a friend like this,”I just feel like I could jump off a cliff!”. He looked at me oddly like he might wrestle me to the ground for we were standing on a bridge at the time but, what I meant to say was, “I feel like I could fly” or, better yet, simply walking won’t do, I had to fly. This present feeling is quite the same. I cannot simply be inspired. I am inspired. So, I must do something, make something, or perhaps…write something. Okay, at this point you may be thinking I’m cracked and simply need to be institutionalized. To be quite honest, I’ve never been tested for any psychological problems and maybe perhaps I should be. After all, I was just bemoaning the fact yesterday that I simply did not have any time to write and am exhausted and now I feel so energized I could write all night long and through the month. So why do I write this hyperactive post? Because I believe those who are inspired should do something. Like a surfer catching waves before the current changes. We should design, sing, be crafty (not the bad sort of crafty), but do something with ourselves that is an embodiment of our joy and satisfaction with life. You hear me out there, part timers? I am talking to you. If I can encourage you to do anything, it is to usher you to your laptop or notepad, or where ever you go to assemble the written language, and shout, “carpe diem!”. Life can be busy, especially with children. 7:00am-8:15am – Get up with June, get her and me breakfast while packing my lunch, getting ready for work, and then throwing down some coffee before sprinting out the door. 8:30am-5:30pm – Work, and travel to and from work. 5:30pm-8:30pm Eat dinner, run errands with kids and Cindy, put June to bed. 8:30pm-12:00am alternate holding Clara, writing, blogging, cleaning, laundry, anything else. How about the weekends? Laundry, kid time, hang out with Cindy time, housework, errands, grocery store, church – and that’s just the basics and does not count traveling for anything, helping friends move, and all other things that sprout up in life. So, as you can see, the writing time is rather limited. This blog is not about me complaining about my family because if you did not already notice and do not know me personally, I spend all of that time with them because I love them dearly and would not trade that time for anything the world. The issue is, just how do parents with kids write? 1. Be prepared at any time. Keep a notebook with you and the ideas churning at all times so you are ready to go whenever. 2. Make goals so you have the mental battle of, “I’m sooo tired, but I promised myself 500 words today. I’ve got to get it done!”. 3. Schedule regular writing time and stick to it. I technically could do 5:30 am any day of the week… yuck, I know. 4. Hang around friends who write for encouragement. Guilt of not writing can be motivation enough to peck at your story again. 5. Sacrifice sleep. This one can be hard because as part timers go we are usually deprived of this anyway. Challenge – 1000 words before Monday?